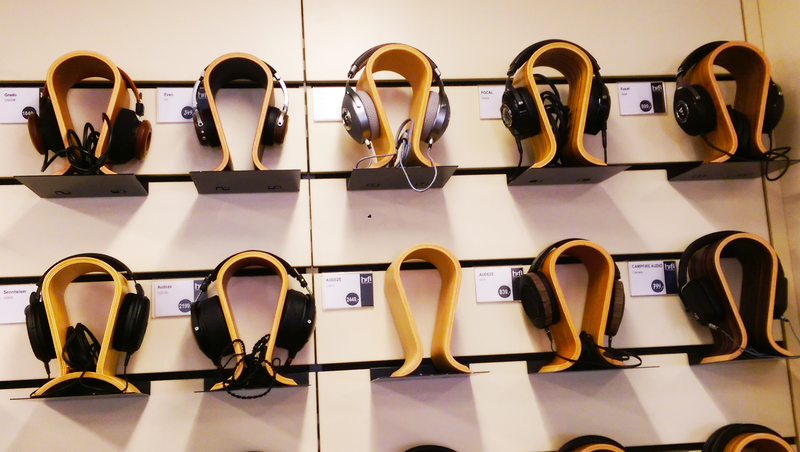 In my last post, I took a brief look at several upper-end headphones. In this edition, I’ll report on several mid-tier models. They were again demoed at Hifisolutions, and driven by a Burson V2 amp. I set the benchmark for the day, with what would later turn out to be a one of my favorites – the Aeon Closed. The Aeon offers what I consider a very beautiful tone; lightly warm, and perfectly smooth. There’s just a very natural flow in the music. Despite its closed back design, the quantity of the mid-bass is quite neutral. It plays more of a supporting role in the presentation, rather than having a thumping, dominant presence. Its bottom-end extension is around average, and it offers a fairly tight bass with moderate impact. Overall, this isn’t a bassy headphone. When it comes to its midrange, the Aeon has a leaner note structure, that is somewhat masked by a slight thickness of the bass. Accordingly, it doesn’t offer a particularly full sound. However, it offers a very nice instrument timbre, with one of the more accurate timbres I heard so far, regardless of price. Its vocals take a slightly laid-back position and are relatively small in size, which I suspect result from a dip in the upper mids. The lower treble was again simply beautiful: articulated, detailed, but smooth, and perfectly integrated in the signature. A headphone I could listen to just for the treble itself. As a result, there is a certain refinement throughout the Aeon’s signature, which is especially appealing. Just a pity that the vocal presentation didn’t do it for me, since I quite was taken away by the tonal balance. The Aeon’s open sibling again offers a tight and controlled bass. Its bass extension did not seem to be very good, although it offered a nice quantity of sub-bass to provide a moderate sense of impact, with somewhat laid-back mid-bass. As a result, its emphasis is on sub- over mid-bass. Compared to the Aeon closed, it provides greater density in its midrange, resulting in more solidified vocals. They are not necessarily full-bodied or particularly large in size, but more balanced throughout the vocal range, with relatively more emphasis around 3-4 Khz. Even so, I would still say there were neutral in terms of forwardness. However, its vocals were neither completely smooth nor natural in tone, due to the laidback quantity of the mid-bass. So, they stilled failed to sound completely satisfying to me. In addition, its resolution could be a bit higher, as could its separation; while its notes were slightly larger than Aeon Closed, its stage wasn’t. I don’t know if it’s me, but the differences between the two were not stereotypical by any means – the Aeon Closed didn’t seem to provide a bassier sound, while the Open wasn’t necessarily more spacious. The difference between the two is perhaps best viewed as a variation of a signature, rather than a different presentation altogether. The entry-level Focal offered a bit higher resolution than the Aeon’s, while improving in layering and separation. The signature however, was less balanced. It is tonally relatively neutral, but a bit uninspiring. The lower treble was slightly prominent, while there was a tendency to harshness in the upper midrange. Due to the upper-mid tuning notes have good size, and the focus of vocals was pretty good. But they missed a bit of warmth and smoothness to sound completely natural, while the lower midrange was slightly laidback. The Elear’s bass offers average low-end extension, but provides primarily mid- rather than sub-bass, even though in overall quantity it is not particularly enhanced. The resolution of the mid-bass however was pretty good. But due to lacking sub-bass, its impact was a bit undefined. Overall, there is a nice punchiness in the sound, although it is not completely smooth, and lacked some finesse throughout its presentation. In terms of timbre, it wasn’t bad, but not exceptional. It’s possible the Elear needs some flavor from a amp, unless this happens to be a signature that someone finds appealing. Audeze’s EL-8 might be their go at a mid-tier model, the quality of their bass remains a staple in their diet. The EL-8 offers good sub-bass extension, with an excellent balance between sub- and mid-bass. A bass that offers a natural presentation of bass-lines, yet sufficient impact to sound engaging. Its lower treble is again slightly prominent. Nevertheless, it’s a nice treble tuning, which offers a high level of refinement in terms of articulation, speed, and detail. The treble tone of the Aeon Closed was more natural, but this is still pretty good. Its vocal position was fairly neutral, with density that was borderline; sometimes they felt a bit thin, leaning towards articulation rather than body, due to the lower treble tuning. Similarly, the tone of the vocals was not completely natural, and could at times use a bit more warmth. But overall the signature is fairly balanced, although it did not display a similar naturalness to the LCD-2, being more reminiscent to the LCD-i4 perhaps. Its resolution however was pretty good within its price range. The Cascade is next in line of what seems to becoming Campfire Audio’s new house sound, at least when it comes to its dynamic drivers: tight, punchy bass, that provides a powerful drive behind the music. It provides great bottom-end extension, and a solid impact. The bass isn’t as dominant as I was expecting, as its quantity seems to be more in line with its signature, at least when compared to its IEM counterparts. What it shares with them however, is a distant position of its midrange. Compared to its mid-tier competitors, the Cascade’s vocals were positioned quite laidback, effectively making vocals small in size. And again, that familiar lower treble peak.. Cascade’s lower treble is quite prominent in its signature, with a brighter tone. Even so, the Cascade’s treble isn’t sharp to my ears, although it results in a pretty neutral signature, especially with the Burson V2. Its resolution in turn was not as high as the EL-8 for instance. But overall, the Cascade offers a punchy sound, resulting from its V-shaped signature. Focal’s mid-tier model offers a particularly coherent signature. Its tone was neutral, but a smoother, more refined version, so it amounted to a more pleasant variation that gently started to lean towards natural. Down low it offers tight, impactful bass with good bottom-end extension, while a neutral quantity of mid-bass contributes to an airy stage. As a result, the stage feels open and spacious. And as its note size is fairly neutral, their placement in the spacious stage leads to great separation, which is further bolstered by its high resolution. Its vocals are neutral in size and forwardness, but focused and dense. Perhaps not excelling, but simply good, without noticeable faults. Furthermore, the neutral vocal position centers them nicely within the stage, enhancing the feeling of three-dimensionality. The treble was detailed and resolved, sounding quick and articulate, while still remaining smooth. Overall, the resolution was noticeably higher than the other HPs, and with it its effects throughout the presentation: the high definition of its notes, airiness, and subsequently, its separation. But with everything comes a catch; Focal’s mid-tier model might have sneaked into these impressions, its price of $1500 is almost double that of the others. Even so, it felt like a breath of fresh air to hear the refinement accompanied by high resolution. The Clear might not belong in this lineup of impressions, it did impress me regardless of its price. Honestly, I can see people preferring it to Utopia. It’s just a very well-rounded tuning, with a neutral-done-right signature that exudes an understated elegance. I only know the HD650 by reputation, but I would assume the LCD-2C is the more obvious upgrade. It offers a warm, smooth sound with captivating vocals. Focal Clear is not really a direct upgrade, because it has a neutral sig that can be bright on neutral amps. So if you want to stay on the warmer side, either the Aeon or LCD2. However, I think there is more of a practical concern to choose between them, since the Aeon is portable and the LCD2 isn’t. So if you’re plan to listen at home from a desktop system, I’d go for the LCD2, but for on the go the Aeon is the more logical choice (which is also pretty nice). I’ve typically preferred IEMs for travel (when I want to go portable, I *really* go portable), so that won’t be an issue for me. Anyway, thanks for the reply! Welcome 🙂 LCD-2C is priced very good at the moment for what it’s offering as a desktop HP. In general, how would you characterize the sound of these headphones to similarly priced CIEMs? Hi Rob, that’s a good question. Thing is, I listened to all these headphones via a desktop amp which will provide more power to the sound, so I can’t make a direct comparison to iems that I listen to via my dap. I will make a direct comparison when I go by next time and come back to you later.